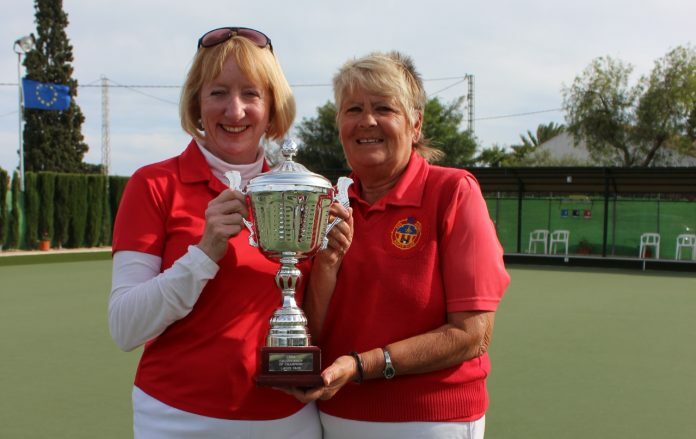 San Miguel ladies Gail Willshire and Lyn Greenland won the ladies pairs in the recent Champion of Champions. They had a fantastic run and a brilliant final. Many congratulations to you both. The rinks reached the semi finals and were having a great game against a very strong team, but lost by only 4 points. Well done to Margaret and Allan Patterson, & Linda and Cliff Plaisted. The Christians had a good result at home against La Siesta winning 11 points to 3. Well played by Reg Cooper, Jim Jarvie, Dave Greenland 25-19: Ken Hope, Alan Campbell, Steve Cantley 20-18: Pat & Dave McEwan, Gary Raby 21-18: Eileen McLaren, Tom Dalgleish, John Marshall 26-11: Margaret Patterson, Paul Hayward, Noel Davis 17 across. Shots for 121 – Against 106. The Moors were away to Vistabella only managing to pick up 2 points. Well done to Don Whitney, Val & Chris Collier. Points for 70 – Against 136. For further information on San Miguel Bowls Club, please contact our President Rosamond Stockell, telephone 965329778 or Secretary Pat McEwan telephone 966714257.